The paw pads on our beloved pets are their most sensitive areas. As humans, we have the luxury of protecting our feet when we go out walking in less than favorable areas. Shouldn't our fur babies have the same option? Our lightweight, breathable pet shoes are soft, yet durable, strong, and flexible, and bend with the animal's paws so they can walk comfortably. 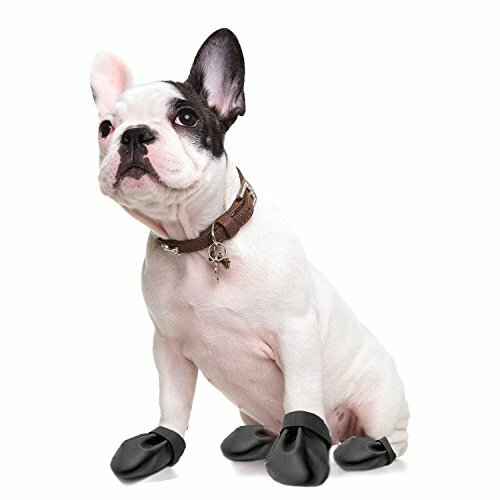 Protect your little furry friend's toes when hiking, swimming, walking outside on jagged, sharp rocks, hot summer sandy beaches, sidewalks and pavement, cold winter snow, ice, and even when climbing a mountain. For lazy dogs, old dogs with arthritis or injuries, or puppies, these shoes provide the traction needed for stability on tile, hardwood floors, and stairs. Keep their nails from scratching furniture, carpets, and flooring. Long-lasting, these booties come in variety packs with multiple options. Best of all, they degrade naturally when you throw them away, so you can protect your pets and protect the environment at the same time! Ensure that male and female dogs (or cats if you're feeling bold) feel like they're walking on air. Paw Control is a family company whose entire purpose is ensuring your pets are protected and happy, and can always put their best paw forward. CONVENIENT: No more struggling. Our shoes for doggies have a wide opening and an adjustable strap so they go on easily and stay on. You no longer need three hands to put on one boot! If you have any questions about this product by Paw Control, contact us by completing and submitting the form below. If you are looking for a specif part number, please include it with your message.